A must-have safety wear for roofers! Roofing and residential construction sectors know the risk of roof top work environment. It requires special safety measures to prevent from dangerous falls. 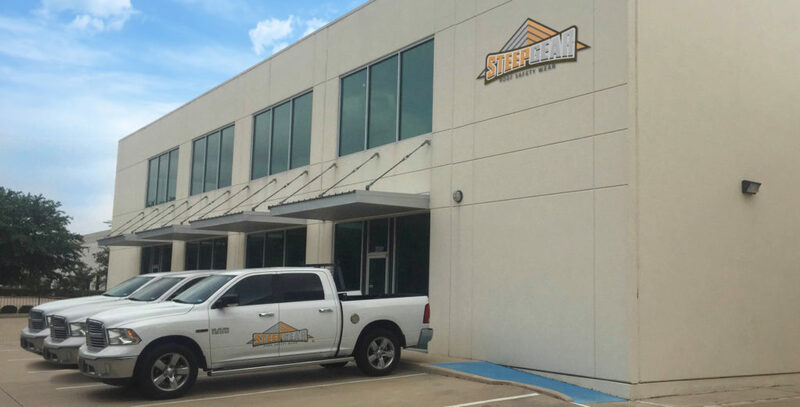 Choose Steepgear, a safety clothing that grips all type of roofing and provides safety from falls. We develop safety clothing that grips all types of roofing, helping you regain control during a fall. We have come a long way from initial concept. 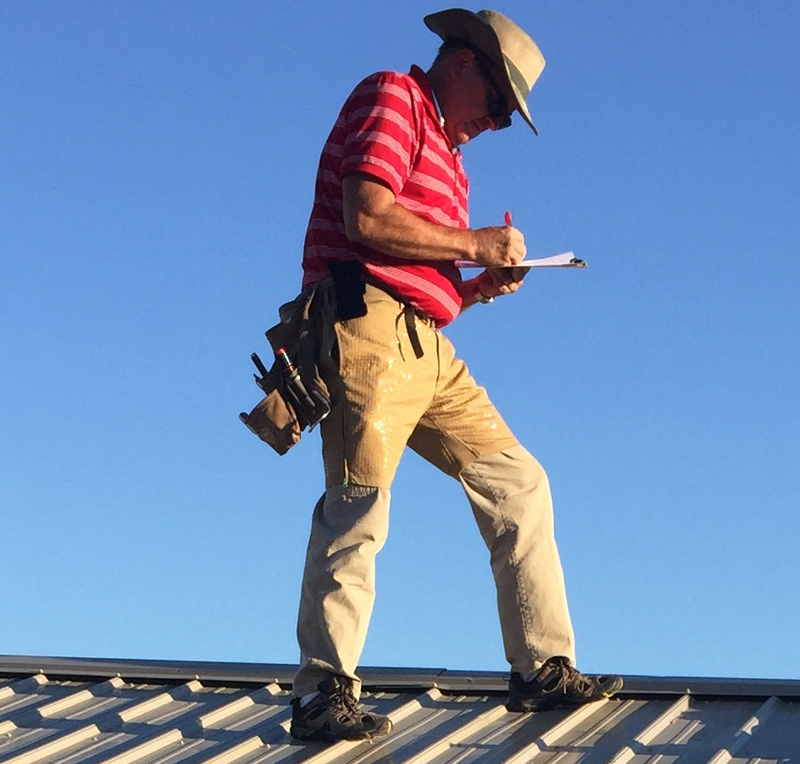 Safety while inspecting roofs during my work as an insurance adjuster is always on my mind. Walking on roofs no matter what the reason is risky. So many accidents and fatalities have occurred due to falls from roofs, and the fear is never far from my mind. In fact, my father was a roofer by trade, and his life ended too soon after he slipped and fell from a roof. Over the years, I realized that even the most experienced adjusters, roofers and craftsmen could become victims of roof related accidents, devastating their lives and the lives of their families forever. I was convinced that some of these tragedies could be minimized or even avoided with the proper safety gear. I became determined to design a type of safety clothing that anyone could wear-from the roofing professional to the average homeowner putting up Christmas lights. An easy slip over garment such as shorts or pants that would slow down or stop further sliding from a roof when hitting the ground is the only other option. After years of testing with different prototypes and roofing surfaces, SteepGear has finally become a reality. We have created a rugged line of clothing for all. This product is designed to be used by anyone that may need to access a roof. Wearing this product along with your other fall protection equipment certainly gives a peace of mind when walking on a roof. We are SteepGear, we care for your safety. These findings don’t even consider adjusters, roof inspectors or any other personnel that access several roofs on a daily basis. Let’s not forget the staggering cost of Workers Compensation claims due to falls from roofs. The National Council on Compensation Insurance (NCCI) states that the average Workers Compensation claims costs per fall from roofs is $106,648 for medical and indemnity costs. Using SteepGear could have an impact on insurance costs if we help avoid the falls all together! of construction related fatalities are caused by falling from roofs, of which 45% are from the edge of the roof. 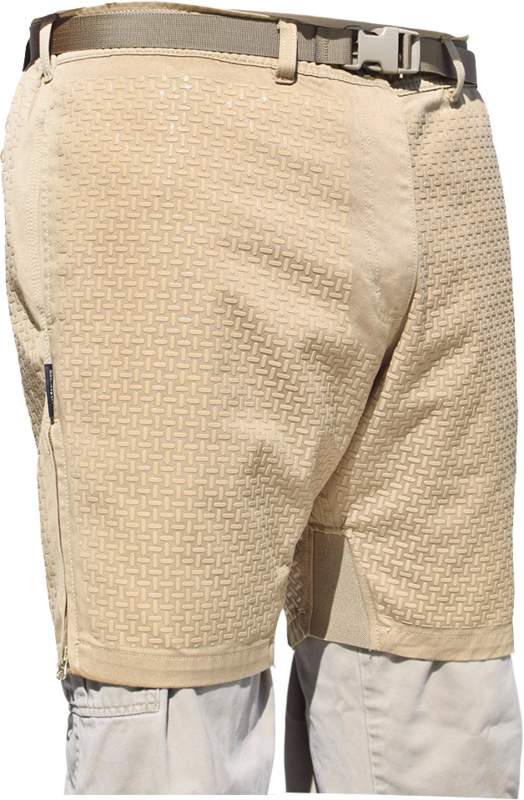 This patented product is developed to reduce the sliding risk between the wearer and the steep sloped surface. We have created a rugged line of clothing to simply slip on over existing clothing when faced with a challenging slope. Whether it’s metal, wood, composition or tile roof material, underlayment, plywood or just about any other surface, this clothing will slow your descent and give you time to regain your balance and footing. This product is developed to reduce the sliding risk between the wearer and the steep sloped surface. We have created a rugged line of clothing to simply slip on over existing clothing when faced with a challenging slope. Our engineers and product designers have worked on several prototypes to ensure a quality product with amazing gripping properties and super strong material to give you peace of mind while on steep surfaces. I should start off by telling you I was skeptical of the idea of the shorts at first. I had something totally different pictured in my mind. I have used them on seven of my high steep roofs in the past week. These shorts stick to the roof so well. I love the cougar paws and shorts combo it makes me feel so much better on some of these sketchy roofs. The zippers on the legs are an awesome idea. This makes them so much easier to slip on and off. I like the belt so it keeps them tight on my waist. The openings on the side for the access to the pants pocket is also a great feature. These have become a go to tool in my bag of gadgets in the truck. I want to thank you for letting me try these out. 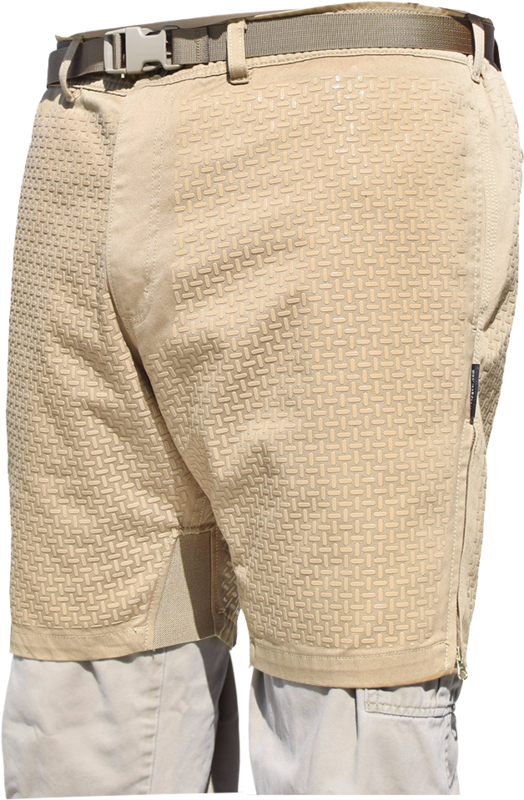 I would recommend these shorts to anyone who is climbing on roofs for any reason. I'm grateful for your product! I was on a roof in the Northeast yesterday. On the way down a gust of wind caught me. I fell and stuck to the roof. I had my paws on and it wasn't that steep - 8/12. The surface wasn't that bad. I just lost my balance. It’s like one I have been on 100 times. I feel I would have slid onto the first level and fell. I wouldn't have gotten hurt bad as it was about 6 feet down. However, it could have been a lot worse and I'm thankful the shorts gave me the time I needed to stay safe and get my feet under me. SteepGear gives me the confidence I need to stay on the roof and do my job. I have a wife and 3 kids, I can’t afford to fall and be out of commission. I call this essential gear for today’s adjuster/roofer! Thanks for keeping me safe SteepGear! Falling on roofs is definitely my biggest real fear. Sadly, there aren’t as many safety devices or products out there to assist once a fall does occur. You’re helpless at that point as a roof doesn’t exactly have places to grab as you slide down (not to mention the emotions as you start to slip down multiple stories to the ground). Finally a product to help once the worst does happen. Cougar paws are great! But they do nothing once you’ve fallen. The peace of mind that came immediately after opening the box and testing them was beyond worth the sticker price. Kudos for inventing this and I hope everyone finds out how high quality and effective this safety gear is! Thank you! 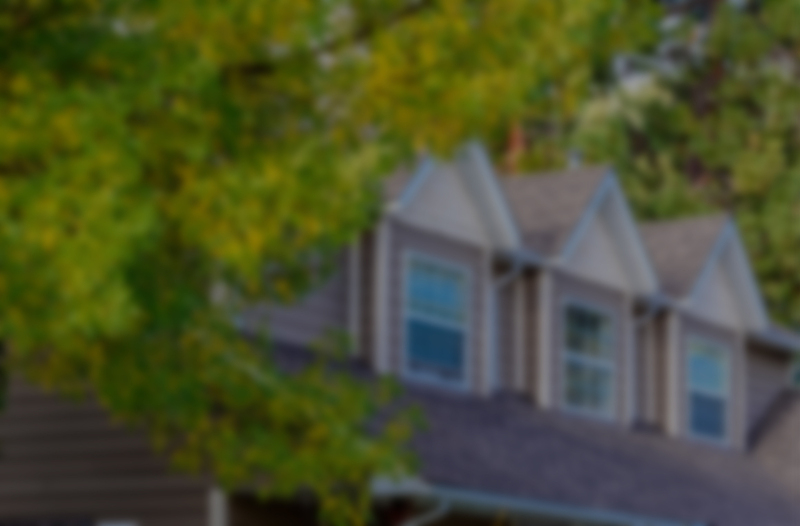 Place your order and realize more confidence on steep roofs. We at SteepGear have done many sizing studies and given the elastic waistband, the adjustable size belt and the elastic on the leg opening, we have developed a range of sizing with both men and women in mind. 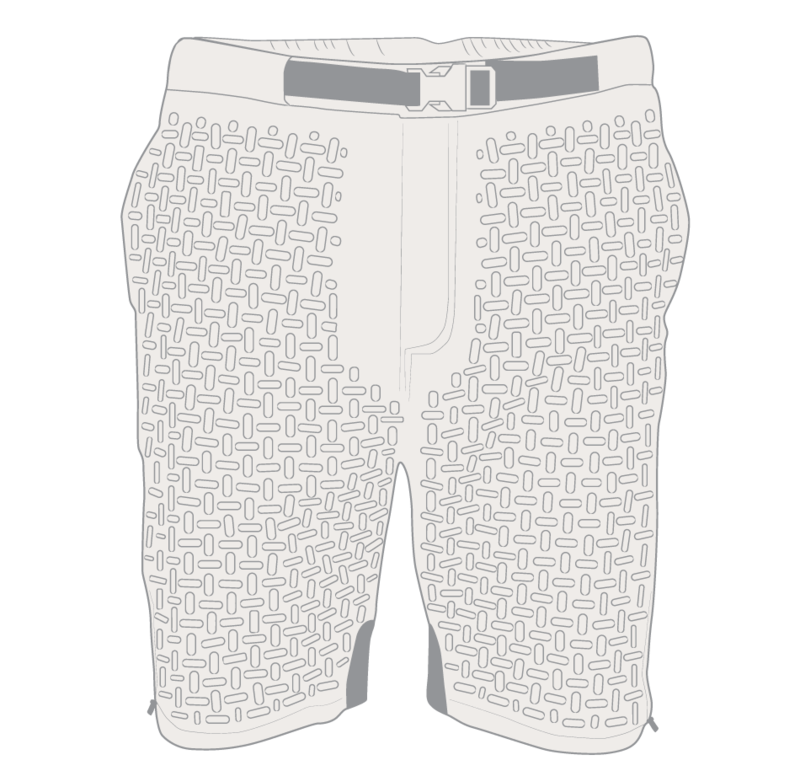 Simply determine the average waistband size of the pants you wear and order that size range. Do not add a size due to SteepGear going OVER your existing clothing. We have already accounted for that. SteepGear products are tested for strength and durability to ensure they will hold up to most conditions for their intended purpose of Emergency Fall Protection. We stand behind the craftmanship, quality and performance of our products and we are committed to providing the finest safety wear products and customer service possible. SteepGear products can be returned within 30 days from the purchase date due to incorrect sizing. The item must be in a new, never used, undamaged condition with the original tags, packaging and copy of the invoice indicating the size desired. Please include your email address and phone number. Mail the item with the packaging to the address below. Return shipping costs are non-refundable. The SteepGear quality team will inspect the product and if it can be resold, we will send out another product of the requested size with regular ground shipping at no additional charge to you. This policy provides coverage only for the first purchaser or gift recipient of the product for 30 days from the original purchase date. If you have questions about our patented products or an existing order, contact us today.